There’s always more time to squeeze in 1 more meal, right? It was sad but I have finally reached Tuesday, my last day in Seattle but heck I was also happy because I knew I would be in SF in a few short hours. During my whole trip I knew exactly what I was going to eat for my last Seattle meal. 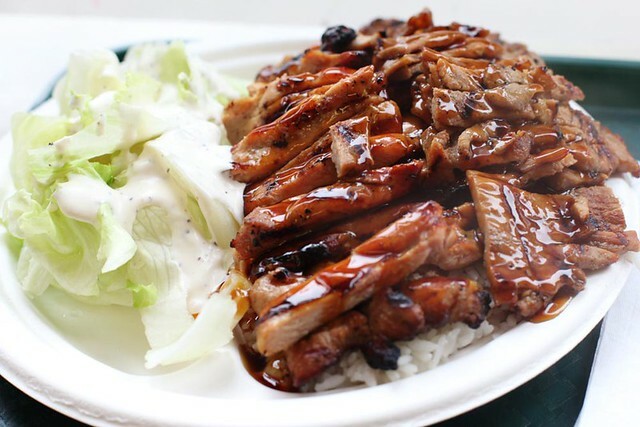 I have read in the Seattle Magazine the phenomenon of teriyaki in Seattle. I wanted teriyaki! It’s such a simple dish to make and oh so satisfying to eat. The plan was to head to Happy Teriyaki around 10:30am, eat, head back to the hotel, pack, check out and get to the train to the airport. Happy Teriyaki was located in the basement, next to a smoke shop, of a building near all the fancy shops. Aaannnddd of course when I got there they weren’t opened. So plan b! I saw on Foursquare, on my phone, that there was Osaka Teriyaki right on Pike Street. It was around 10:40am when I walked in. I hope they didn’t think I was weird for eating teriyaki chicken for late breakfast, early lunch. I thought about ordering the chicken special but I went for the chicken and pork combo for $8. I realized, in Seattle, there were no letter grades like in LA and NYC. If Osaka got a grade it would’ve been an F but an A for food. What the lady behind the counter handed me was a plate of about 2.5 bowls worth of rice, meat enough for 2 people and a pile of raw lettuce with a ranch and pepper dressing. The teriyaki sauce was sweet and a bit too salty BUT the saltiness went away when eaten with the rice which then became perfect. The chicken was all dark meat, tender and some pieces were crispy and charred. The pork were thin slices of meat with some nice fatty parts. Like the chicken it was grilled which resulted in some areas being charred, good charred. It really hit the spot as a breakfast, people should eat more rice for breakfast. Just across the street was a deli or something that sold burgers and sandwiches with a teriyaki neon sign.